This year sees the delivery of several interesting new ships, a new Queen Elizabeth and Nieuw Amsterdam, for one thing, both named for famous Transatlantic liners, and two brand new designs, Marina from Oceania and Le Boreal from Compagnie du Ponant, each the first of a pair. 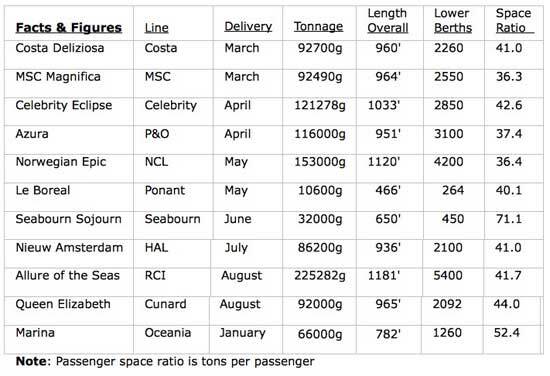 Plus new deliveries for Costa and P&O. And all from Fincantieri. We also look at the start of cruise lines placing new orders again, with one order from Carnival, two from Princess, all three from Fincantieri, and one, maybe two, from MSC with STX France, as of last week. Three new orders at Fincantieri, one for Carnival and two for Princess, a new order at STX France from MSC, the recent floating out of Ponant's Le Boreal, Cunard's Queen Elizabeth and Oceania's Marina (and the revelation that her sister ship will be named Riviera), and Norwegian Epic's sea trials, together with the christening last week in Dubai of the Costa Deliziosa and in Dover of the MSC Magnifica, along with the delivery next month of the Celebrity Eclipse, all come together to introduce a new crop of cruise ships for 2010. The most famous ships named Nieuw Amsterdam Queen Elizabeth were of course ocean liners, the largest ever built by Holland America Line and Cunard Line and delivered respectively in 1938 and 1940. Now, seventy and more years later, the two lines are still in existence and both part of Carnival Corp & PLC, and the two North Atlantic liners namesakes spring from the same basic design, called the Vista class. The 92,000-ton Queen Elizabeth, at 965 feet, will carry 2,092 passengers in lower berths while the 86,200-ton Nieuw Amsterdam, at 936 feet, will carry 2,100 passengers. The Queen Elizabeth is of a slightly elongated design that was originally used for the Queen Victoria in 2007. The main difference between the two Queens will be in their internal decoration. Floated out at Fincantieri's Monfalcone yard in January, the new Cunard ship will feature double and triple-height public rooms on a grand scale, luxurious rich wood panelling, intricate mosaics, hand-woven carpets, sparkling chandeliers and marble. Art Deco features will pay homage to the original Queen Elizabeth. The Nieuw Amsterdam on the other hand, the fourth ship to bear that name since 1906, will be similar to the Eurodam of 2008, and will feature a new pan-Asian restaurant called Tamarind on one of the top decks and a casual Italian restaurant on the Lido deck, while her cabins will feature a new decor. The 92,700-ton Costa Deliziosa, at 960 feet, has 2,260 lower berths. While also springing from liner company, but a more recent one, again now owned by Carnival Corp & PLC, she is another derivation of the Vista class. She and her sister ship Costa Luminosa will both be based out of Dubai, giving Costa a more homogenous product from that port and lots of balconies. In 2011, the Costa Deliziosa will perform Costa's first world cruise in many years. Two more ships are raising an awful loot of interest because they are both being completed to a new design, and also they will look more like ships than floating resort hotels, something that pleases those that follow ships. First to be delivered will be Compagnie du Ponant's 10,600-ton Le Boreal, which although a reasonable size at 466 feet, will only carry 264 passengers, all in outside cabins and 95% with verandas. With the introduction of this vessel and her sister ship, L'Austral, to follow next year, Compagnie du Ponant has decided to open all their ships up to English-language cruisers at all times. Along with French cuisine and French wines, this should be a real winner. An indication of the quality of these ships can also be taken from the fact that upmarket operator Abercrombie & Kent has taken Le Boreal for their 2010-11 Antarctic season. The other new design, again the first of a pair, is Oceania's 66,000-ton Marina, which was floated out last Thursday. While today regarded as of moderate size, at 782 feet she is only eight feet shorter than that Cunard record breaker, the first Mauretania. She and her sister ship, to be named Riviera and to be delivered in 2012, will carry 1,260 passengers in plenty of space, and among her features are a Lalique staircase and interior design by Ralph Lauren Home. The two ships were designed by Yran & Storbraaten, the renowned Norwegian architects whose work has included ships for Sea Goddess, Seabourn and Silversea, in that order. And one ship built as the final development of a tried and trusted old design, is the 116,000-ton Azura, which at 951 feet, will have 3,100 lower berths. Her design dating back to the first of the "Grand" class, that appeared twelve years ago, she will probably be the last to be built to this design since Princess has now developed a new prototype. Unlike her sister ship Ventura, which caters for families, the Azura, the "newest superliner for the UK," will be an adults only ship so it will be interesting to see how the initial ship reviews compare with the somewhat unfortunate Ventura, which has now apparently been tweaked into a more than satisfactory product for the UK market. But unfortunately for those who like quiet in deck, she will feature a movie screen on deck known as "Movies under the Stars" which some have called MUTS. The most remarkable thing about all these ships, Queen Elizabeth, Nieuw Amsterdam, Costa Deliziosa, Le Boreal, Marina and Azura, and their sister ships, is that they were all built in Fincantieri shipyards. Non-Fincantieri ships like the Seabourn Sojourn from Marriotti, Celebrity Eclipse (more on her in a future column, but see The New Celebrity Equinox August 03, 2009) from Meyer Werft, MSC Magnifica and Norwegian Eclipse from STX France and Allure of the Seas from STX Finland, have become the minority. It has also been Fincantieri that has landed the first three new orders since the onset of the present world economic crisis. During February both the Norwegian Epic and the Azura both completed their initial sea trials before returning to dry dock for completion and we will hear more of these ships later. After a lapse of a year with no new orders, shipyard order books have finally started to revive, even if only lightly. Carnival companies were first, with a 130,000-ton order for another sister to Carnival Dream and Magic, for delivery in 2012, and two orders in mid-February for a new 139,000-ton prototype ship for Princess, for delivery in 2012 and 2013, all three placed with Fincantieri. Following them closely was a report last week from France that MSC was ordering a 148,000-ton slightly revised version of the Fantasia class (with 100 more cabins) from STX France, for delivery in 2012, with possibly a second order to follow. No details have been released yet on the new Princess ships, although some reports say they will be a fresher development of the Ruby Princess. Even if a new design they are bound top retain the most successful aspects of the present fleet. Last Monday, we said about Royal Caribbean that "the last time it tried to sell Celebrity in the Australian market, it ended up cancelling the program (and there is still no word on whether Celebrity might try again once all their new ships are delivered)." 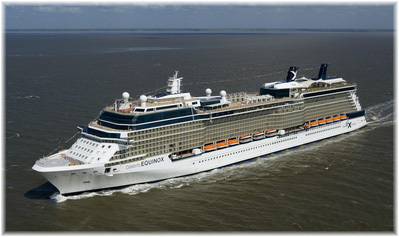 On Wednesday, an alert Lars at Cruise Line Fans posted the following "The Celebrity Century has been confirmed booked into several Australian ports in the late 2011 early 2012. So far this is all I know but hopefully Celebrity will issue a Press Release soon." And of course the Celebrity Millennium was there a year ago but had to cancel an Auckland to Sydney cruise because of a pod failure. Christopher Wright at Mariport Limited in Digby NS has pointed out that Pearl Seas Cruises' new ship, the 246-berth Pearl Mist, has not yet been accepted due to alleged fault, and has been laid up at Shelburne NS since November 20, 2009.